On Saturday, July 6 at 7:00 PM theater practitioner and scholar Daniella Vinitski gave a presentation on the now defunct Brooklyn-based experimental opera-installation-performance company, GAle GAtes et al. Vinitski traced the trajectory of company work through descriptive analysis, personal interviews, and archival footage. GAle GAtes operated throughout New York City, internationally, as well as from its 40,000 square foot warehouse home in DUMBO (Directly Under the Manhattan Bridge Overpass) from approximately 1995 to 2003. 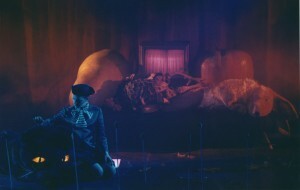 According to The New York Times, GAle GAtes was “an adventurous troupe with one foot in the world of post-modern art and the other in downtown performance.” The company was known for its large scale and visually-driven productions, and was often inspired by great literary works and historical moments, such as The Odyssey, The Divine Comedy, the invention of the camera and the burning of Rome. While GAle GAtes garnered a high level of notable reviews and funding over its lifetime, such as by but not limited to: Art Forum, Art in America, The New York Times, PAJ: A Journal of Performance and Art, The National Endowment for the Arts, The Rockefeller Foundation, the Greenwall Foundation and the Lower Manhattan Cultural Council, among others, the company ultimately collapsed in 2003. Daniella Vinitski is a theater practitioner and scholar with an emphasis on classical, experimental, and physical theater. She has worked with or studied under major artists such as Colorado Shakespeare Festival, FUSION Theatre Company, Wendell Beavers, Marina Carr, Michelle Ellsworth, Marie Overlie, and Pig Iron Theatre Company, among others. She is also the recipient of numerous awards and fellowships in recognition of her work as an actress, director, playwright and researcher, and has experience teaching and performing in Philadelphia, New York, Colorado, and the Virgin Islands. Most recently, Daniella was the recipient of the University of Colorado Graduate School Beverly Sears grant and the Richard Knaub writing award in support of her dissertation, as well as a 2010 Boulder County Arts Alliance Emerging Artist award. As a researcher, she has presented for the Association for Theatre in Higher Education, the Mid-American Theatre Conference, the Philadelphia Theatre Research Symposium, and has been published by peer-reviewed periodicals such as The International Journal of Performance Art and Digital Media (IJPADM), Ecumenica Journal, and performance art volume Emergency INDEX. Vinitski holds a BFA with honors from New York University’s Tisch School of the Arts Experimental Theatre Wing, and was one of sixteen drama students selected to study Shakespeare in Performance at the Royal Academy of Dramatic Art in London through NYU. She holds a Masters from Villanova University, where she was honored as Acting Scholar, and will be graduating with a PhD in Theatre from the University of Colorado August 2013. *Photo above: 1839 produced by GAle GAtes et al. Actress: Kate Moran. Puppetry: Manju Shandler. Lighting: Jason Boyd. Direction: Michael Counts. Archival photo courtesy of Shandler.